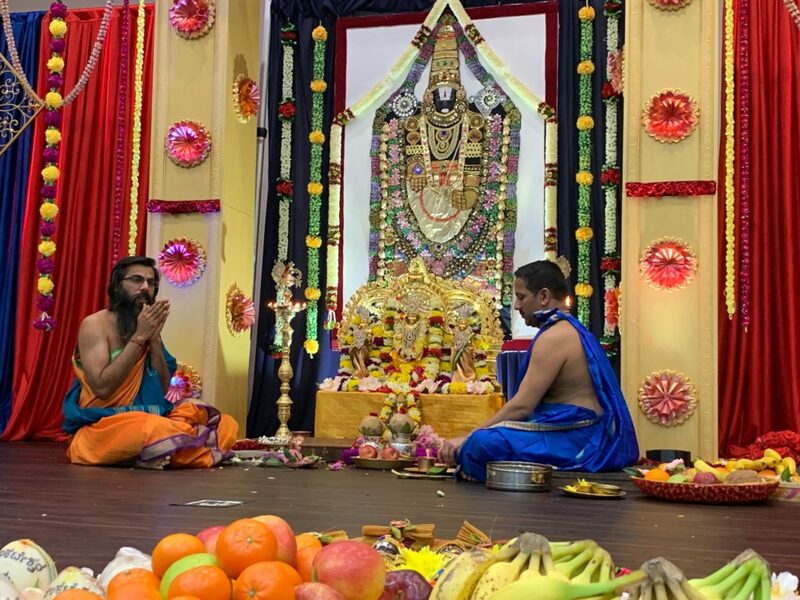 Atlanta, GA, April 3, 2019: A unique ceremony celebrating the wedding of Lord Venkateshwara, Sri Srinivasa Kalyanotsava, organized by Sri Krishna Vrindavana (SKV) Temple of Atlanta attracted well over 700 devotees from Georgia, Alabama, North Carolina, South Carolina and Tennessee on May 24, 2019 at the Gurukul in Duluth. Along the lines of a traditional south Indian wedding, the ceremony included a decked hall. Wedding preparations began the previous day with Tarakari Shastra, where vegetables are arranged in decorative patterns and later cut to size by devotees. Rituals included Battha Kuttida Shastra, that involves pounding of grains and pulses, Dibbana, welcoming the groom, Lord Venkateshwara and his brides Goddesses Lakshmi and Bhudevi in grand processions. In a grand finale moment, garlands were exchanged and Mangalya Dharane concluded the grand proceedings. Devotional Bhajans accompanied by instruments and traditional dance performances throughout the rituals enhanced the experience. Traditionally, south Indian devotees visit Tirumala to be blessed in abundance of money, Udupi to be blessed with food, and Panduranga to seek blessings in music. Puttige Mata, through the Kalyanotsava endeavors to combine the experience of visiting all these places of pilgrimage on one auspicious occasion. Priests Yogeendra Bhat Uli and Jayaprasad Acharya presided over the wedding rituals along with lavish preparations including ornate decorations and elaborate food preparation with a menu that included puran poli, mysore pak, rava laddoo, boondi laddoo, (prasad) and kheer apart from at least 10 other different dishes. “Being far away from home, we are blessed to be part of such an event” said Veena Madwesh, volunteer. READ THE REPORT IN OUR APRIL 2019 E-PAPER!